How To Gain Muscle Quickly | Liveinfo360 | Step By Step Guiding! Want to look better and burn more calories even while resting?You will if you add some muscles to your frame.Whether you want to be the next Arnold Schwarzenegger or just want to a defined/toned physique like Lazar Angelov, you’ll need to build some muscle mass. So here are some tips on how to gain muscle quickly and get the body of your dreams. The law of progressive overload simply says that you must increase the number of reps or the weight lifted every single workout [or as close to the this as humanly possible] in order o ignite muscle growth.The body adapts to stimuli, so how do we use this to our advantage? Well, the key is to place ever increasing the weight you can handle and can also make incremental increases over time to spark muscle growth. So, if you want bigger biceps, you must increase the weight you are lifting every session or the amount of repetition. 8-12 reps on any given exercise will stimulate most muscle growth.Lower rep ranges of say 3-6 work well for building strength but not necessarily muscle hypertrophy (growth). Higher reps e.g. 15-20 can indeed stimulate muscle growth but it is far from optimal.You should be lifting a weight so heavy that you can’t get more than 12 reps but light enough to allow you to get at least 8 reps. Yes, just 6-9 sets per body part.if you are working out with good form this is all need to stimulate muscle growth. You want to keep your workouts under 45 minutes to avoid the release of hormones that actually break your muscle tissue down (catabolic hormones). Luckily, you can easily accomplish this by performing a maximum of 9 sets per body part. Working a muscle tears the tissue, it then repairs and grows.Muscles need to be fed in order to allow them to grow. Basically, you need to eat big to get big.A good bodybuilding diet will allow you to grow without adding fat at the same time. [Protein=Muscle] In order for muscle tissue to repair itself after your weight-training sessions it needs an abundance of protein. 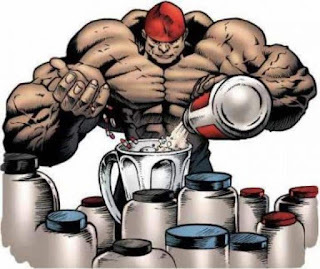 Some beginner doesn’t take enough protein and some more experienced guys take the ridiculously extreme amount of protein requirements. My favorite source of the protein includes [Chicken, Egg, tuna, salmon and whey protein. If you can afford to use supplements, then by all mean do so.Why?Because they work! however, I would stick with basics such as protein powder, creatine, glutamine, BCAA, and multi-vitamin. The bottom line concerning these supplements is that they work provided that you work. Getting enough water is crucial for peak strength and energy levels.You should shoot for around 12×8 ounces glasses of water per day. Remember you can include your protein shake towards your daily water intake. Cardio work will rob your muscle gains.Yes if your goal is to lose fat you should do cardio but make sure it is:(a) Performed immediately after your weight training. (b) High into intensity interval training form of cardio for the maximum of 20 minutes. The reason is that too much of cardio isn’t desirable when a goal is to build muscle is that too much cardio releases catabolic hormones in the body, breaking down your muscle tissue. Sleep is so important for building muscle.We know that muscle tissue repairs itself and grows during the rest period. (a) the release of growth hormones reaches its peak during deep sleep. (b) your metabolic rate slows which is perfect for muscle tissue repair and growth. (c) increased blood flow to the muscles. So This is an easy guide on how to gain muscle quickly.